Antje obtained a PhD in Zoology from the University of Kiel, Germany in 2007 and is now based at the Percy FitzPatrick Institute of African Ornithology, University of Cape Town, in South Africa. Her research focuses on understanding the processes that regulate seabird distributions, demography and population dynamics, and applying this understanding to the conservation of threatened populations. She is particularly interested in investigating the mechanisms that are driving population declines in order to identify appropriate management strategies to reverse or prevent these trends. As a co-investigator in the South African National Antarctic Programme, her latest project brought her to Tristan da Cunha. Located in the middle of the South Atlantic, half way between South Africa and South America, this archipelago is home to over 80% of the Endangered Northern Rockhopper Penguin. The vulnerability of this species and the penguin’s precarious population status were most evident in March 2011 when the MS Oliva grounded off Nightingale Island. 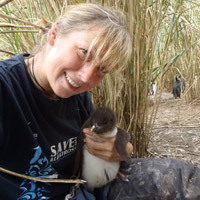 In immediate response, together with the Tristan Conservation Department and the Royal Society for the Protection of Birds, she launched the initiative for a project comparing aspects of the penguin’s ecology at breeding sites on Nightingale and Gough islands to help understand the potential impact of any natural and/or anthropogenic threats to this population. Her commitment and dedication to the conservation of Northern Rockhopper penguins led, last year, to being appointed as a consultant for this species for the Tristan da Cunha government.